For the second straight year Mother Nature threw all teams a curve ball with heavy rain and thunder storms to start the day. 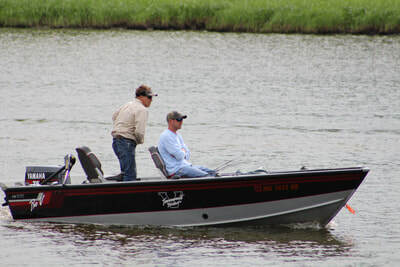 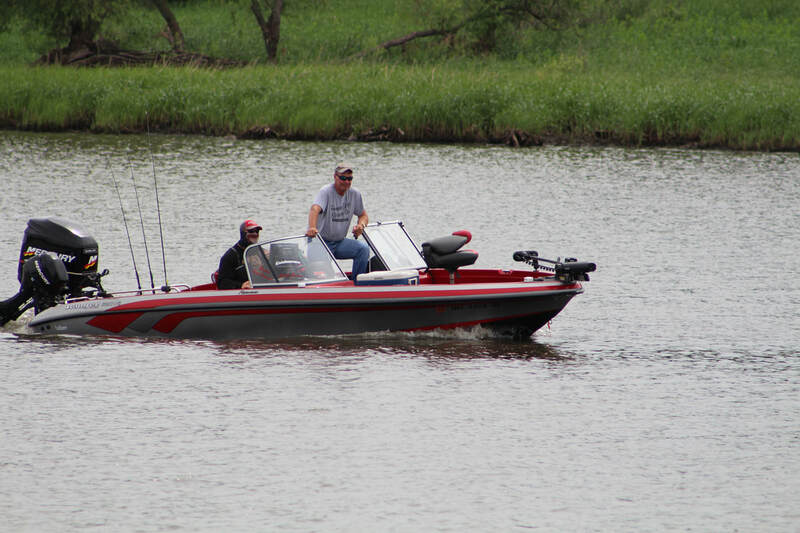 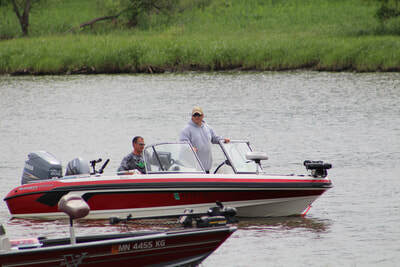 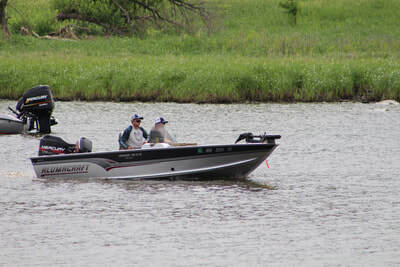 The rain and storm systems continued for about the first 4 hours of fishing. 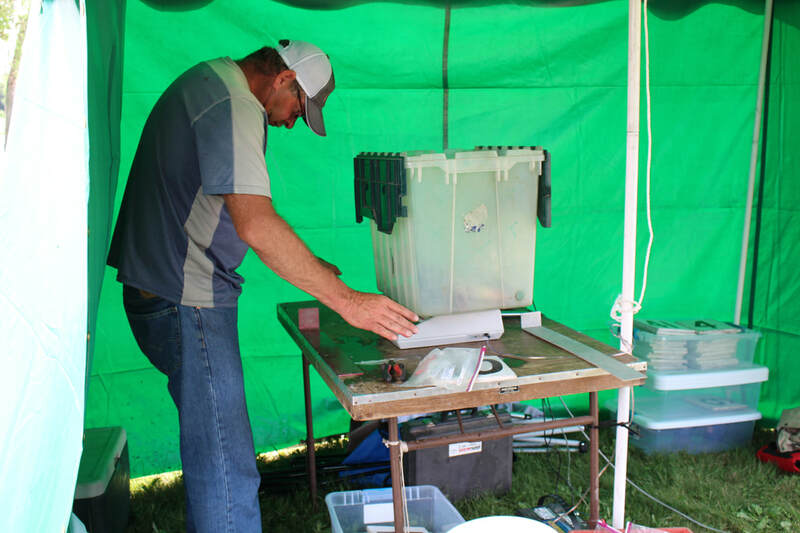 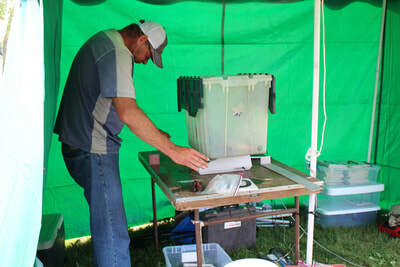 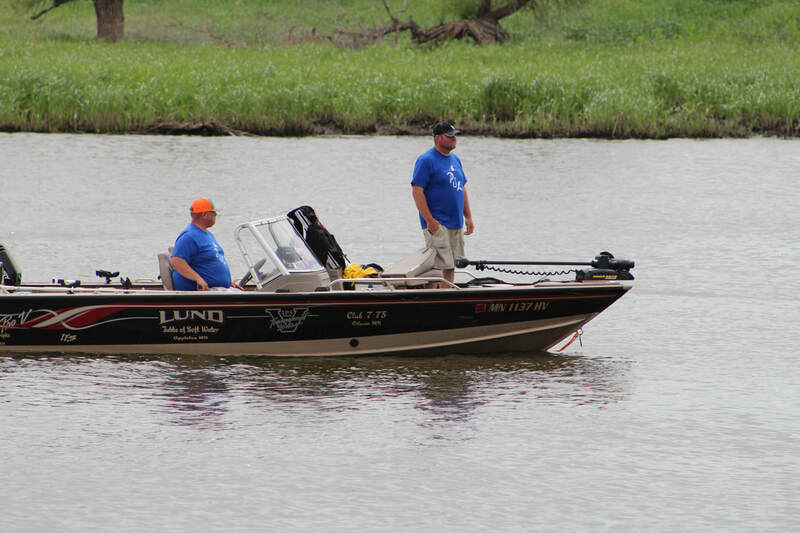 All teams battled extremely dirty water conditions. 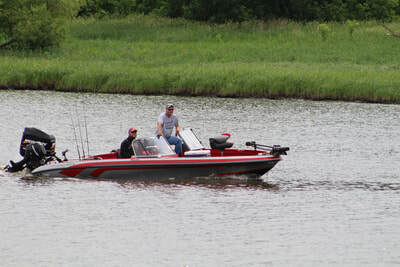 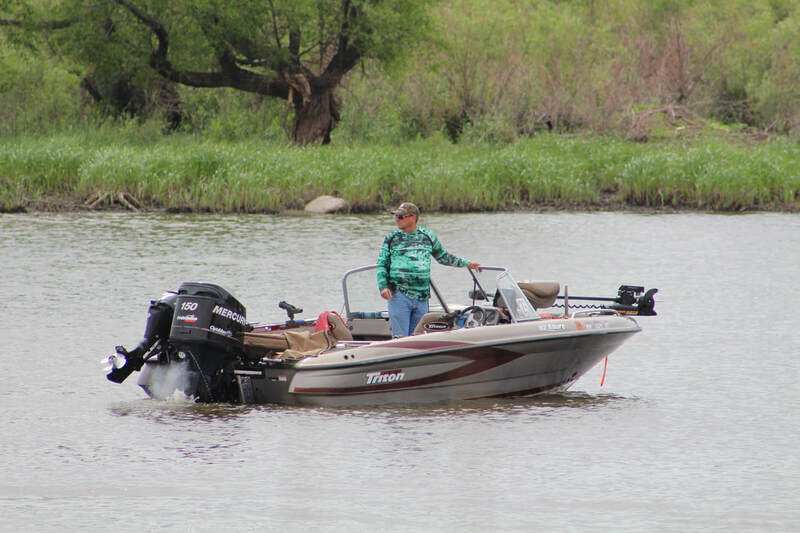 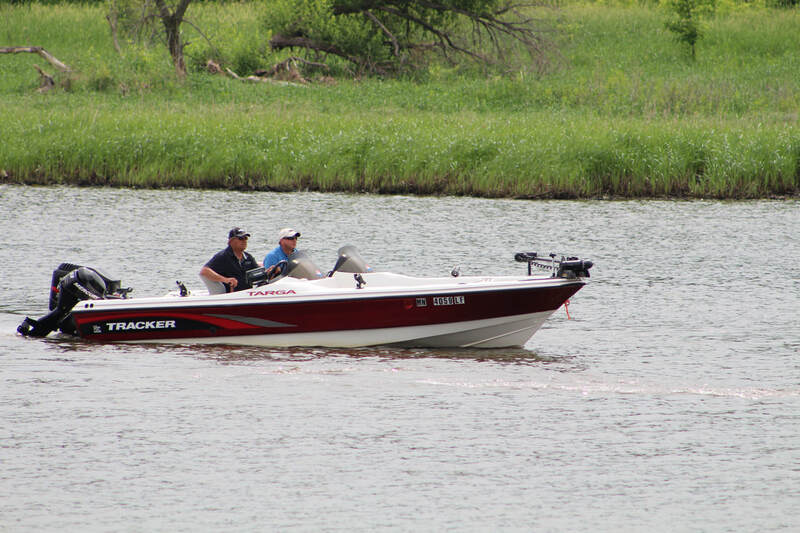 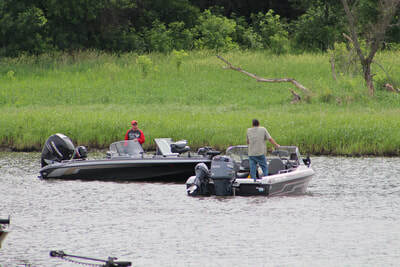 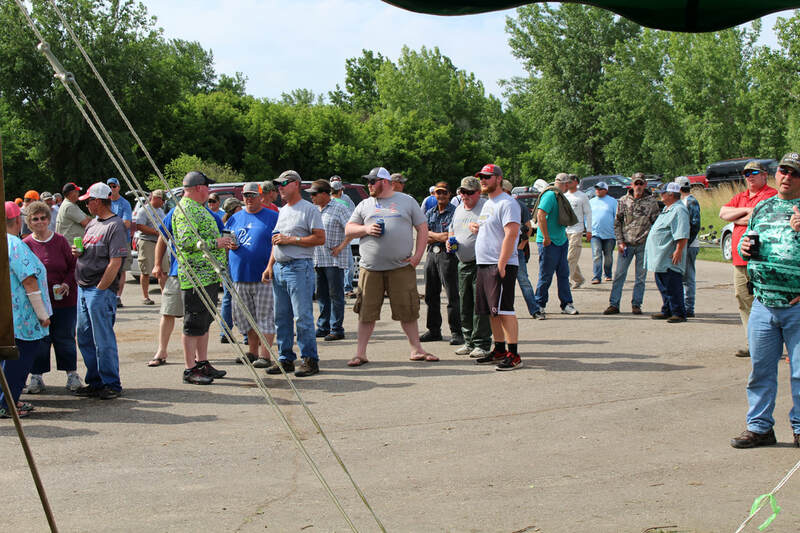 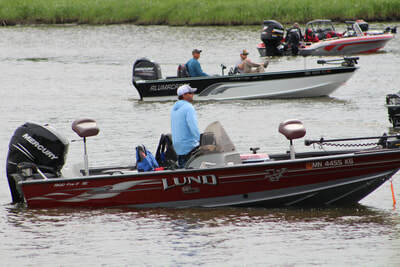 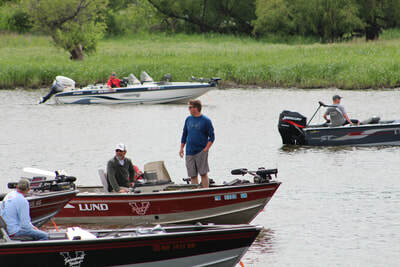 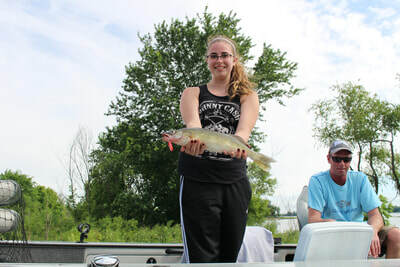 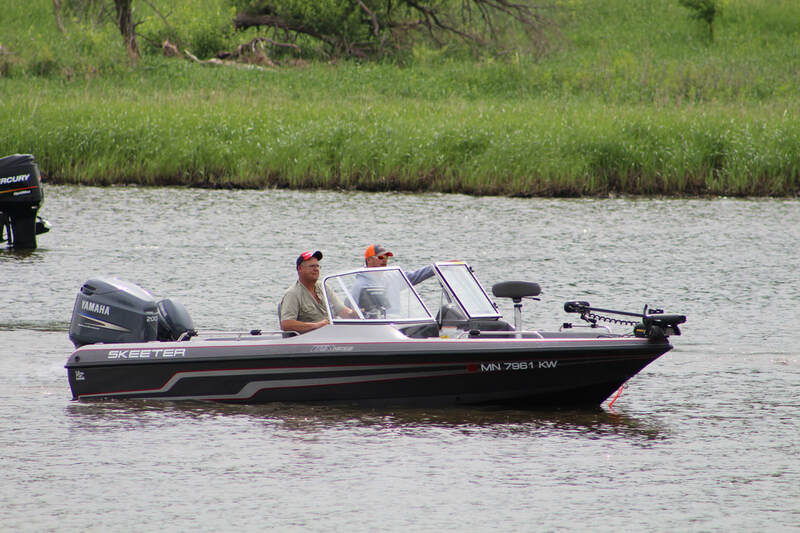 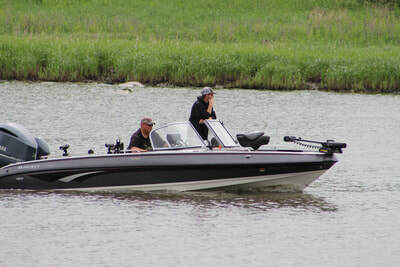 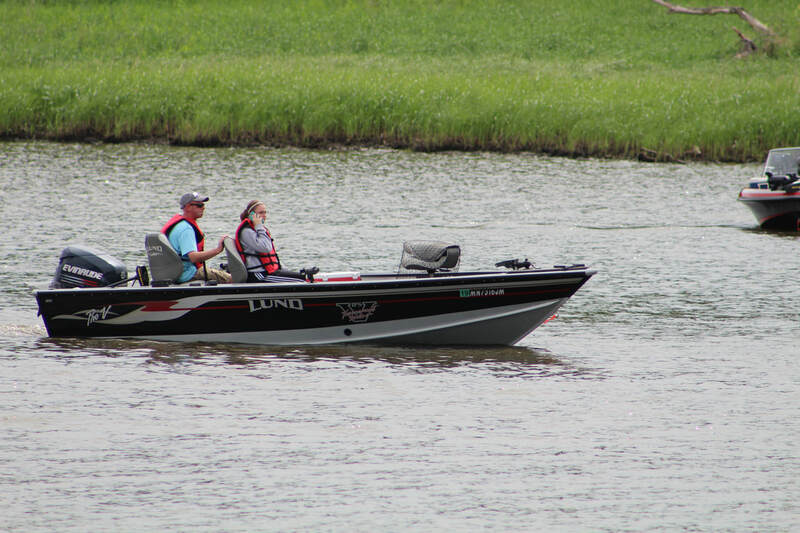 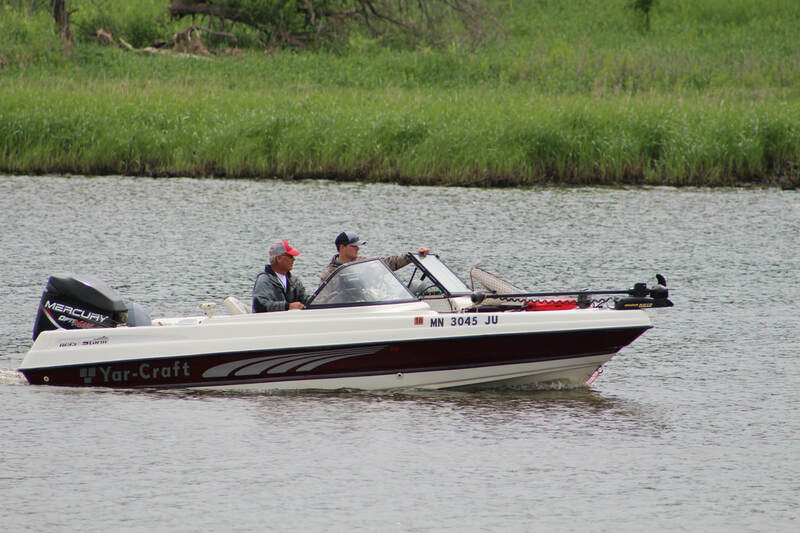 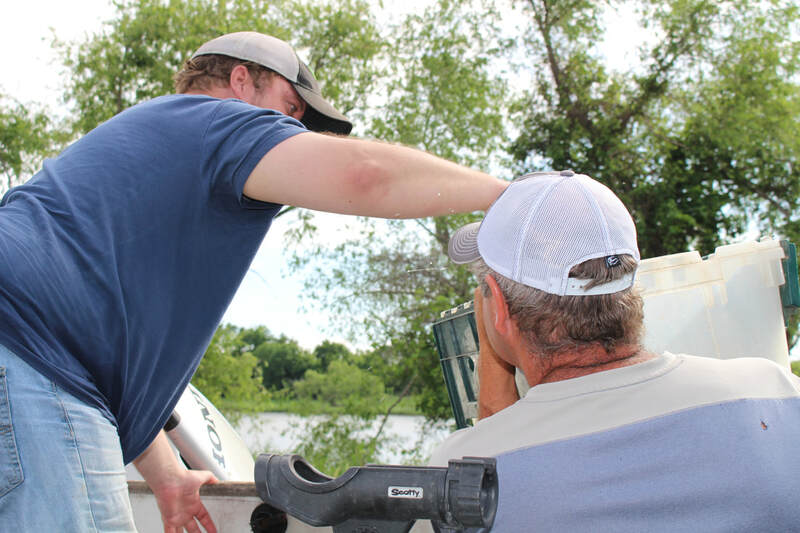 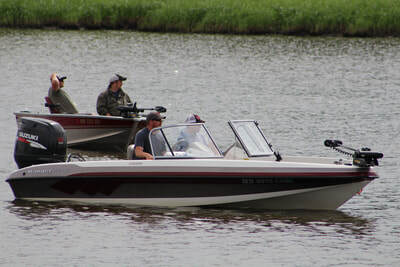 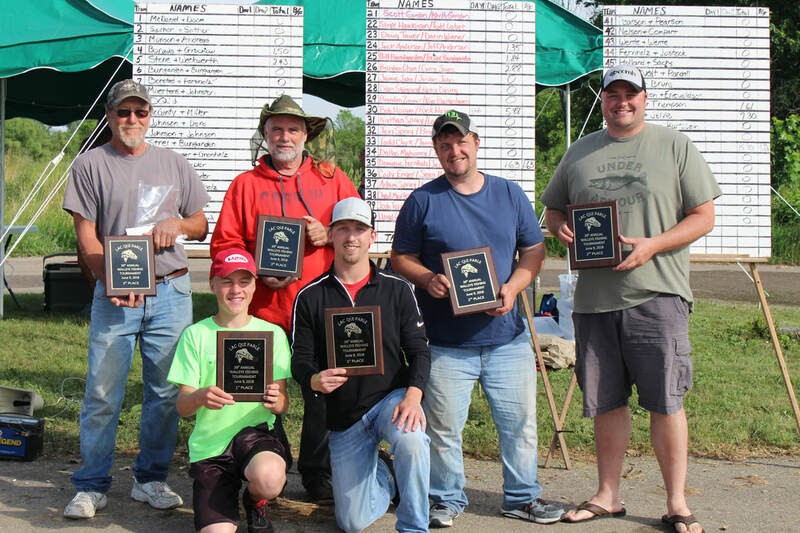 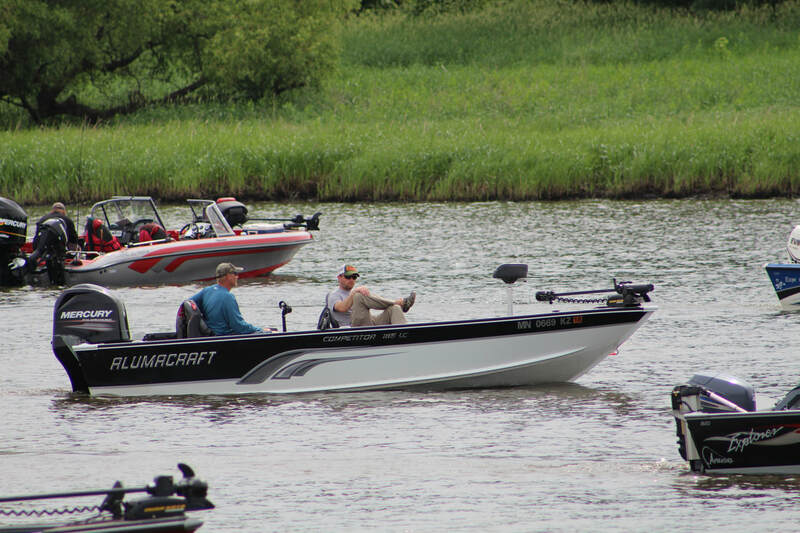 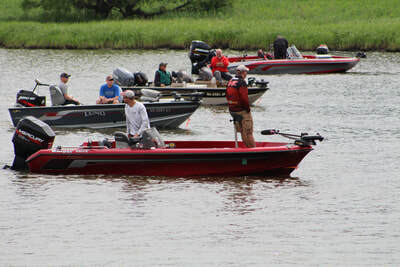 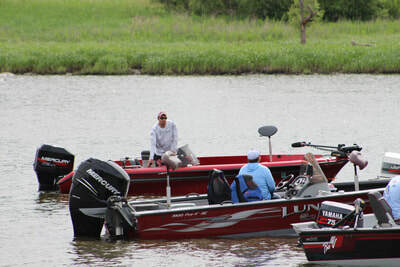 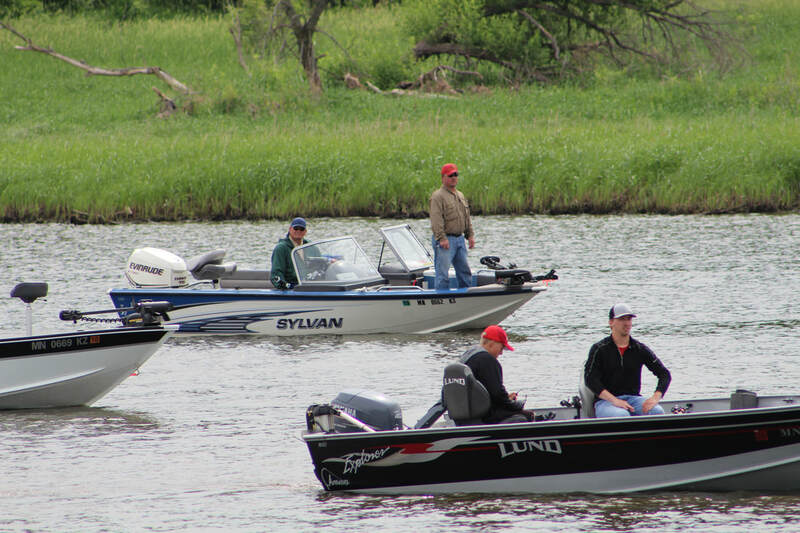 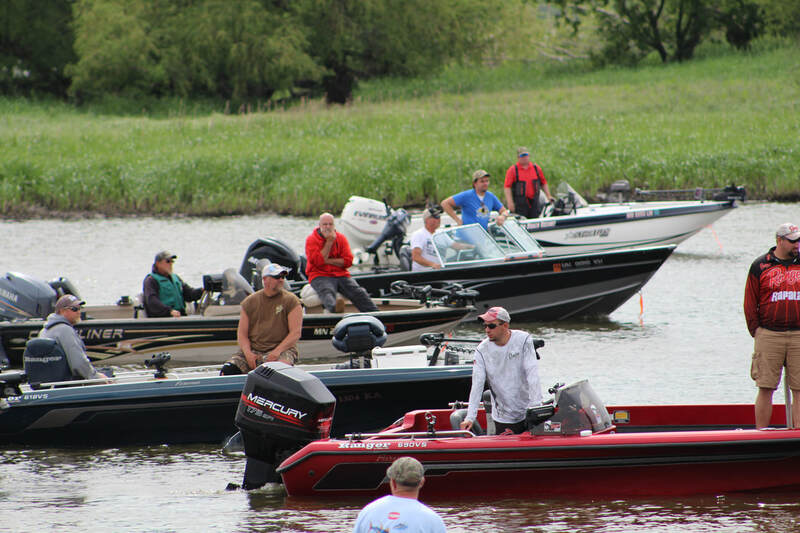 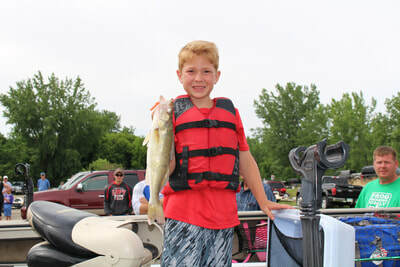 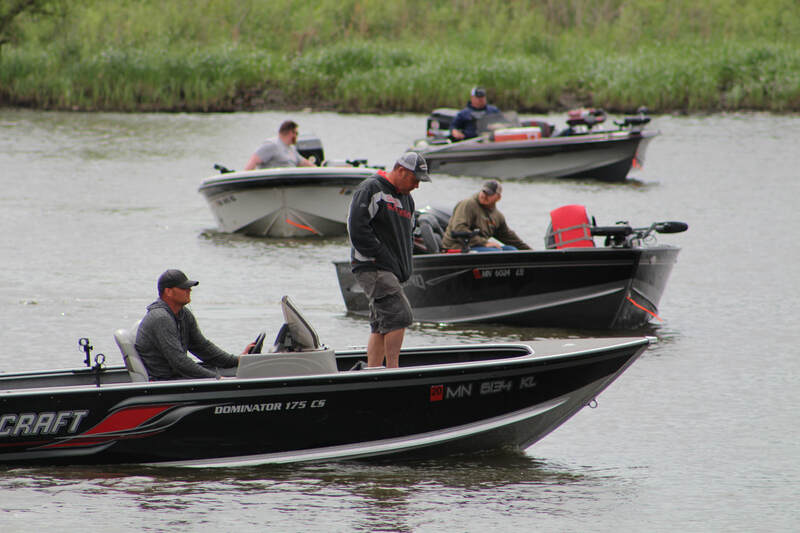 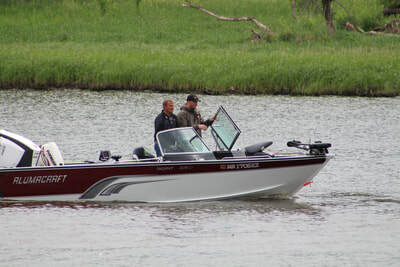 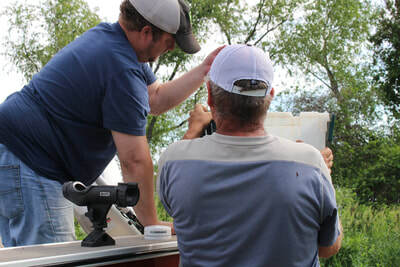 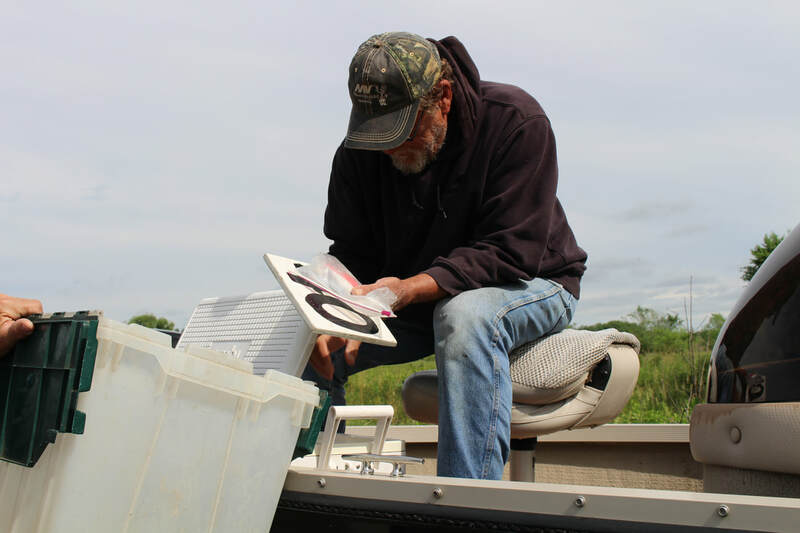 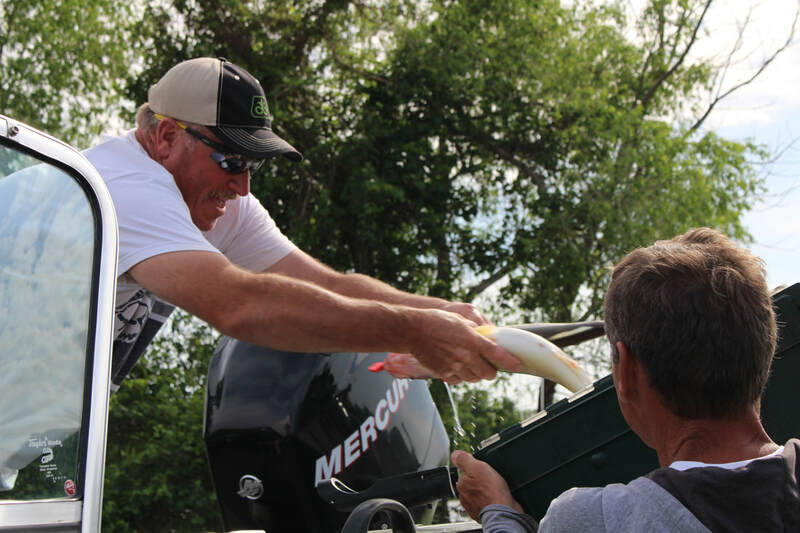 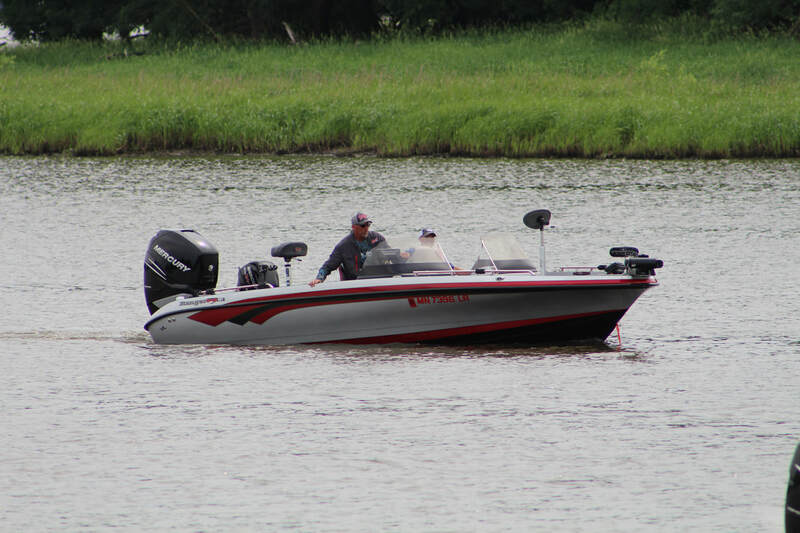 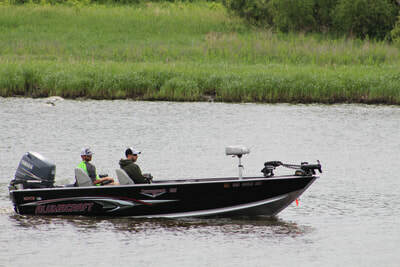 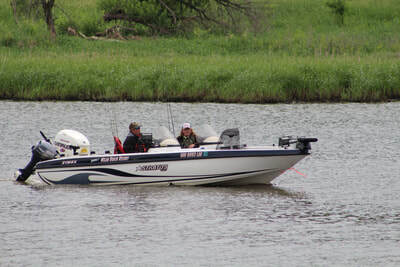 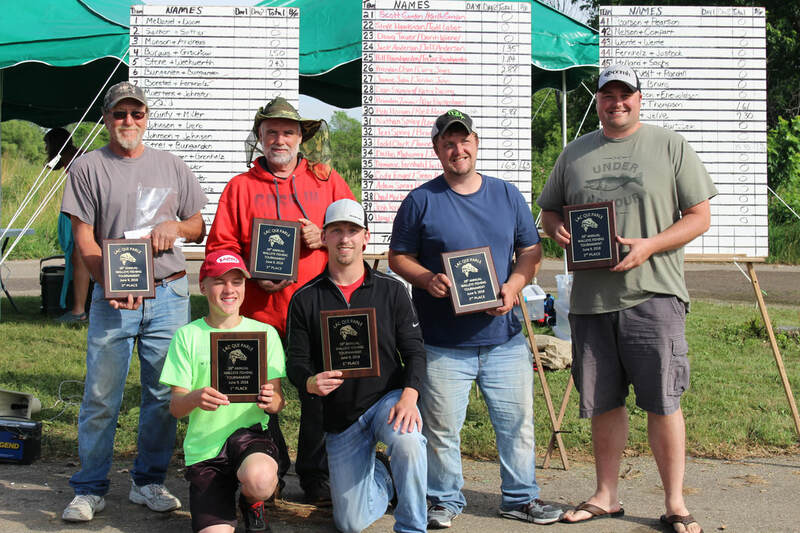 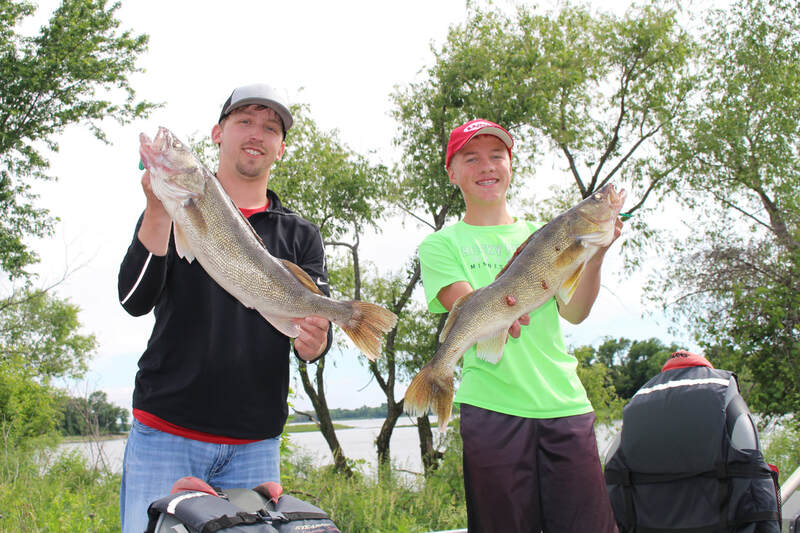 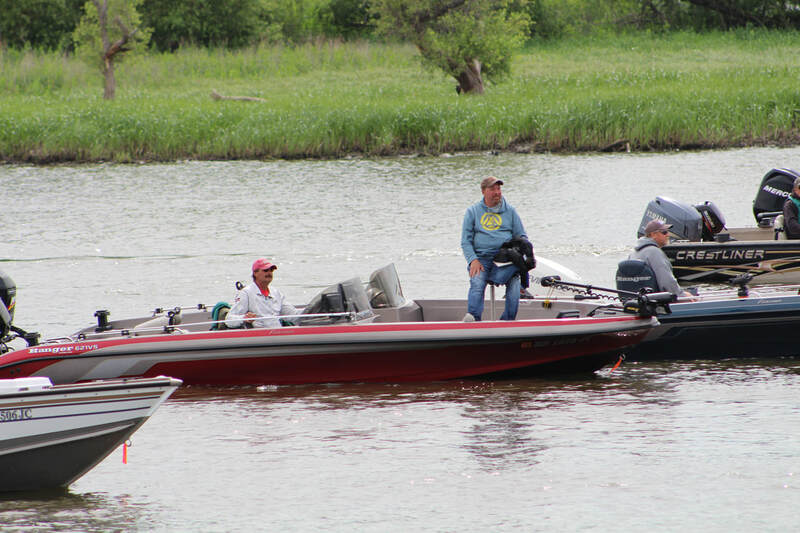 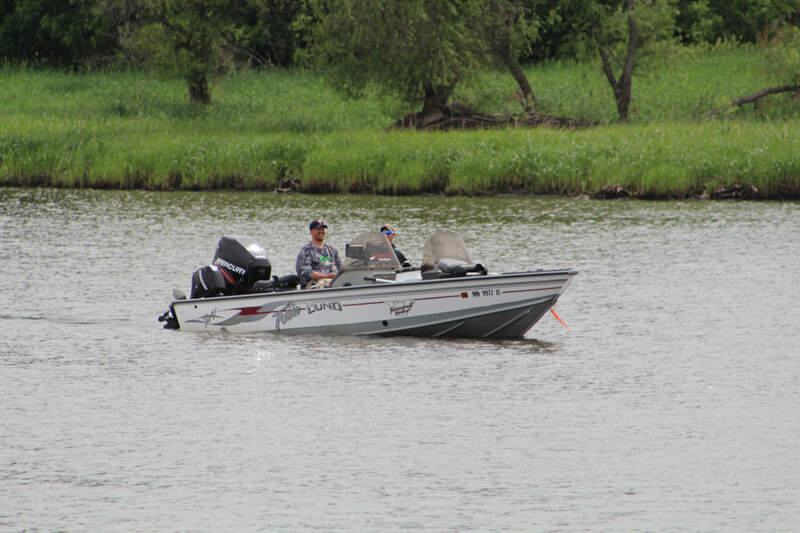 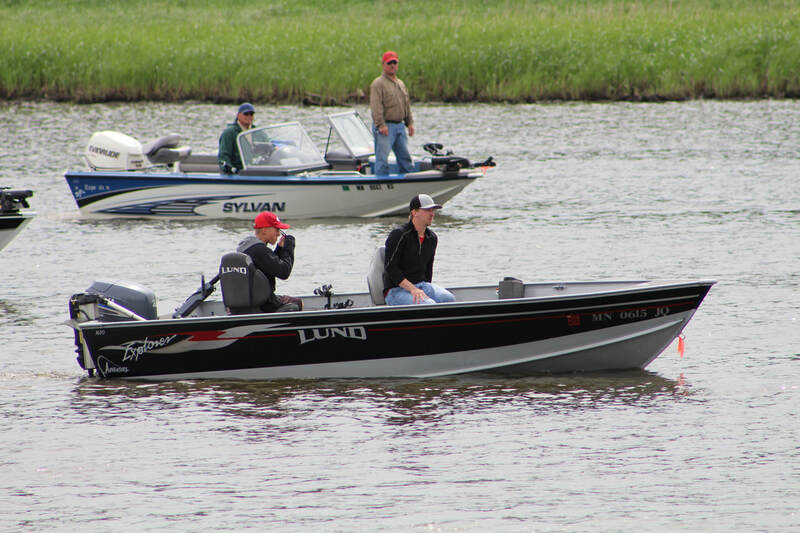 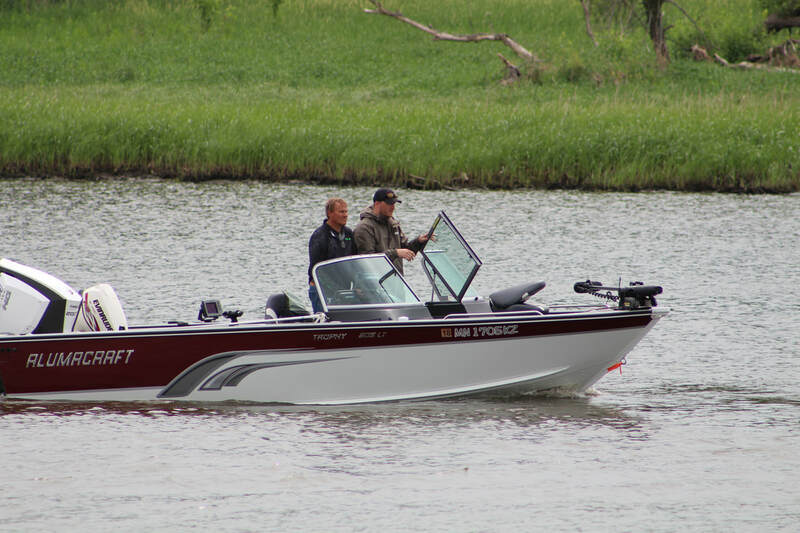 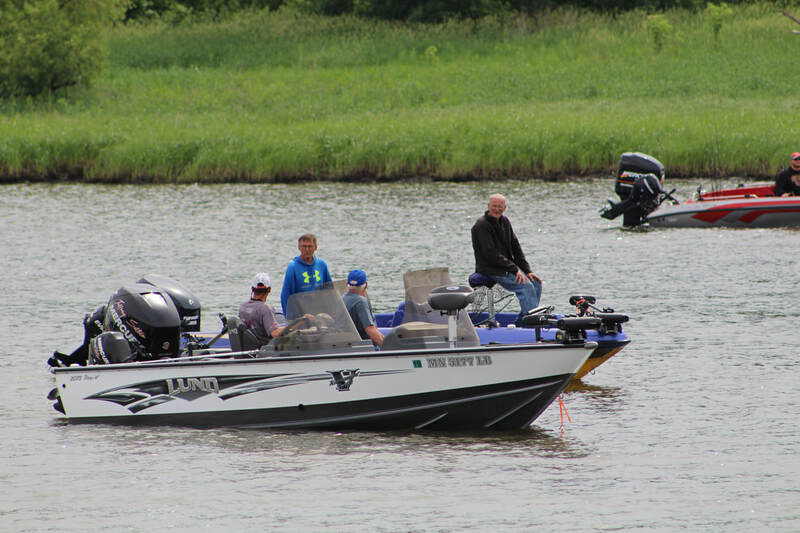 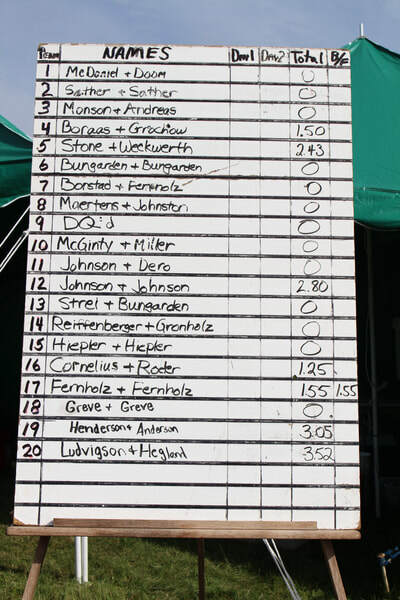 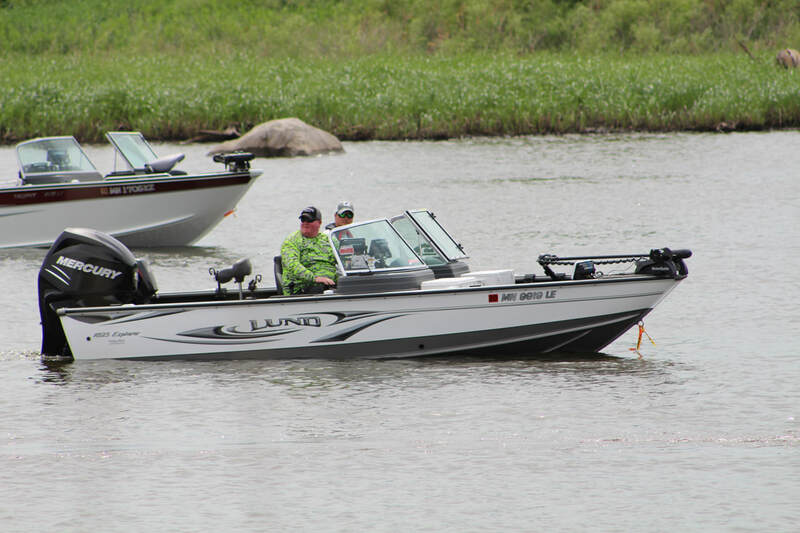 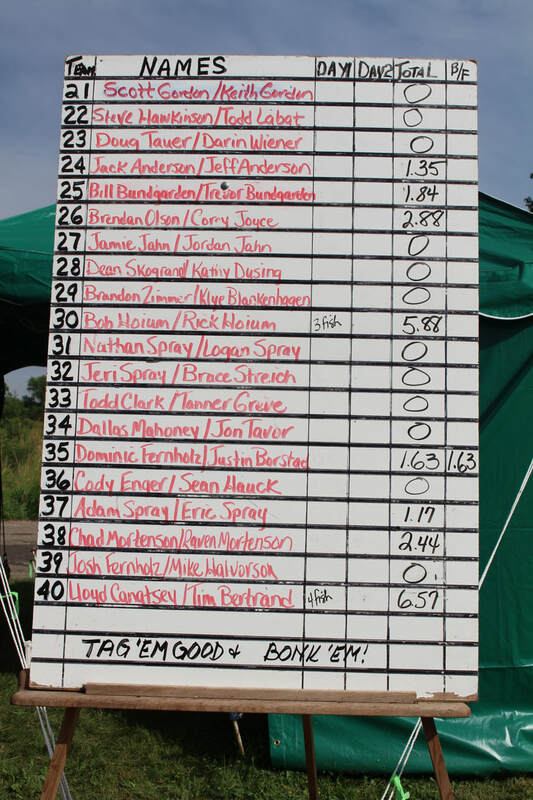 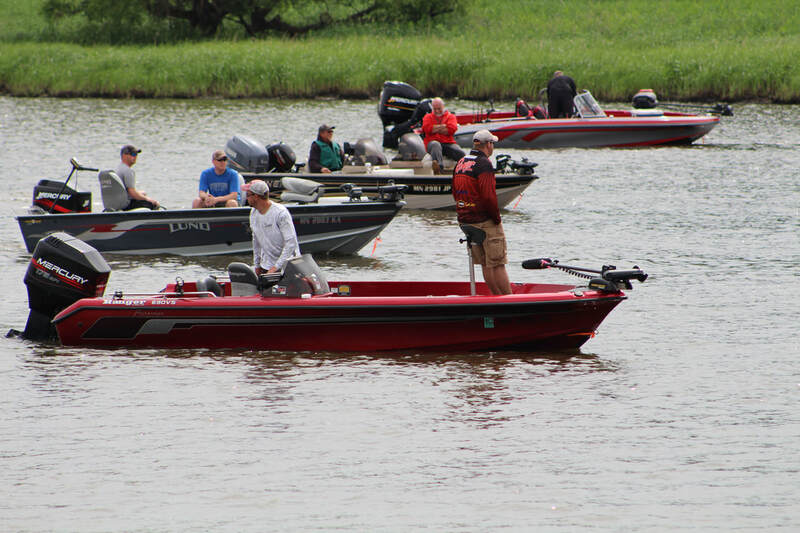 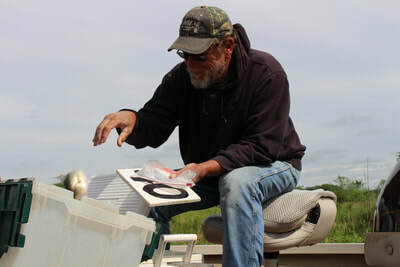 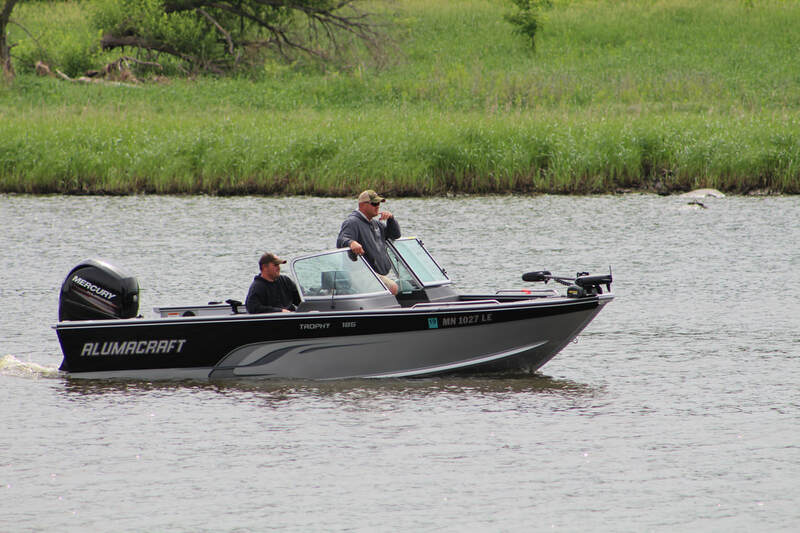 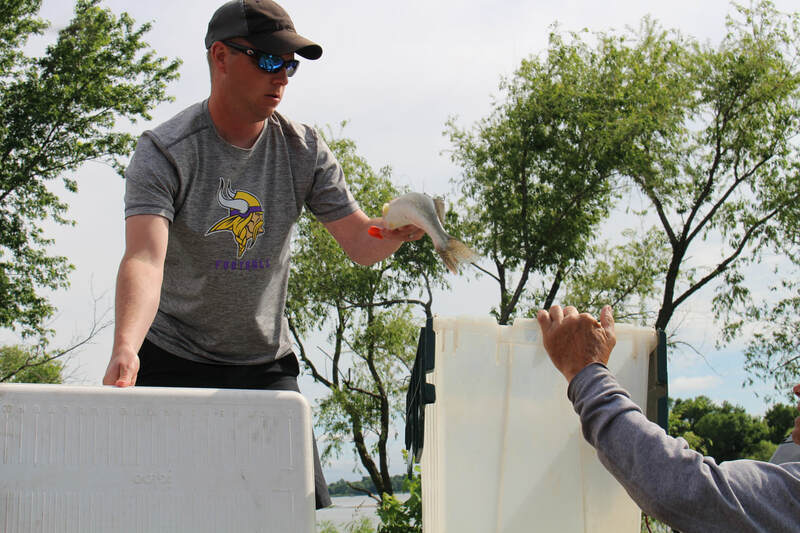 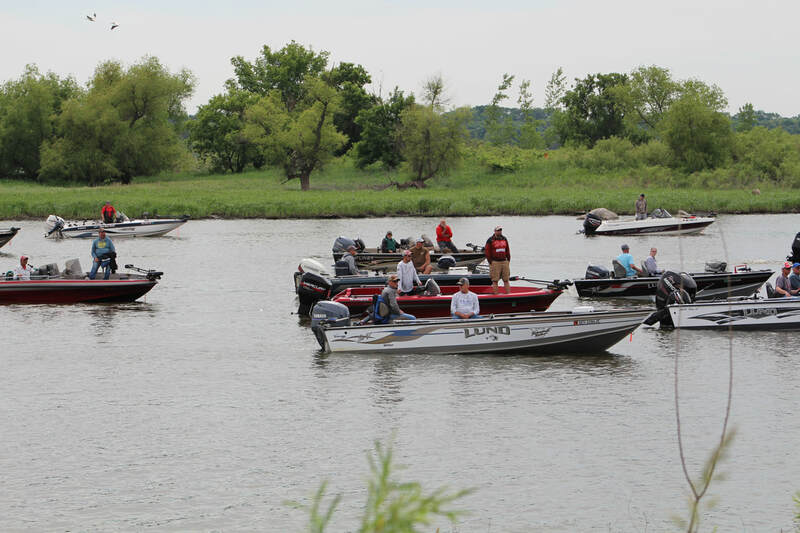 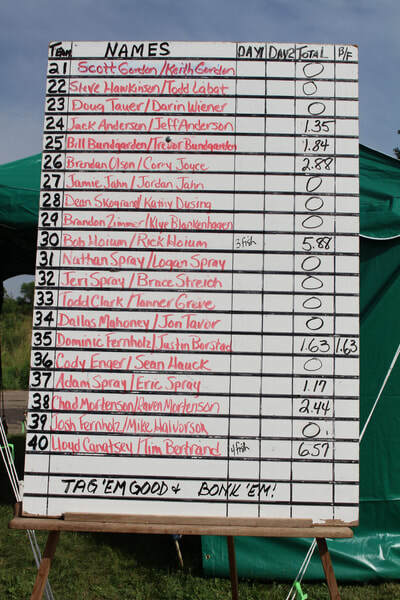 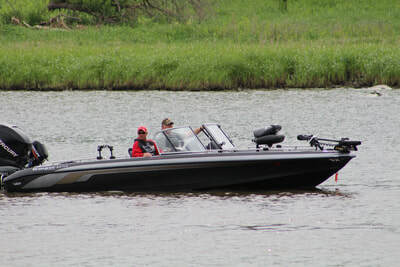 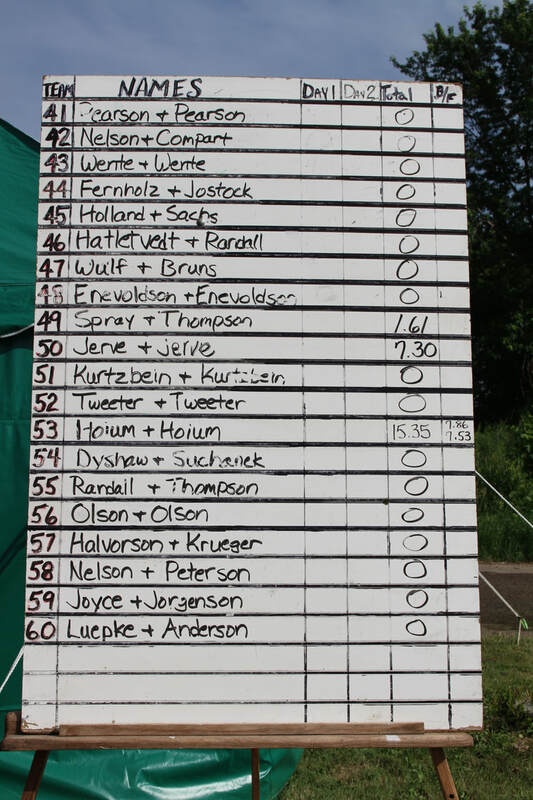 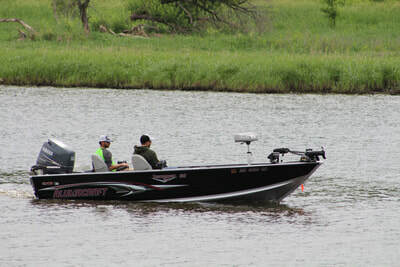 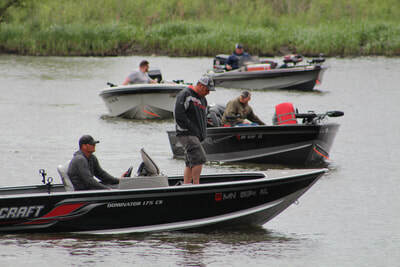 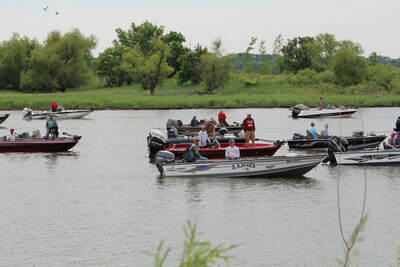 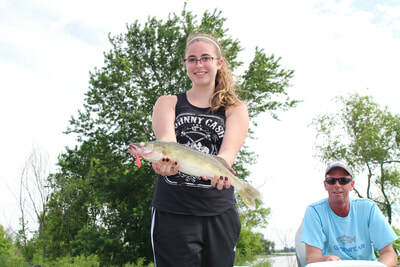 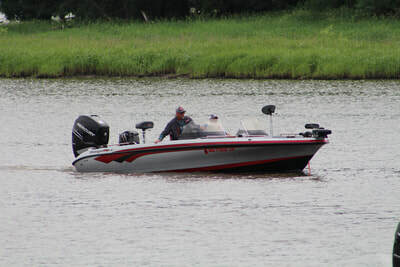 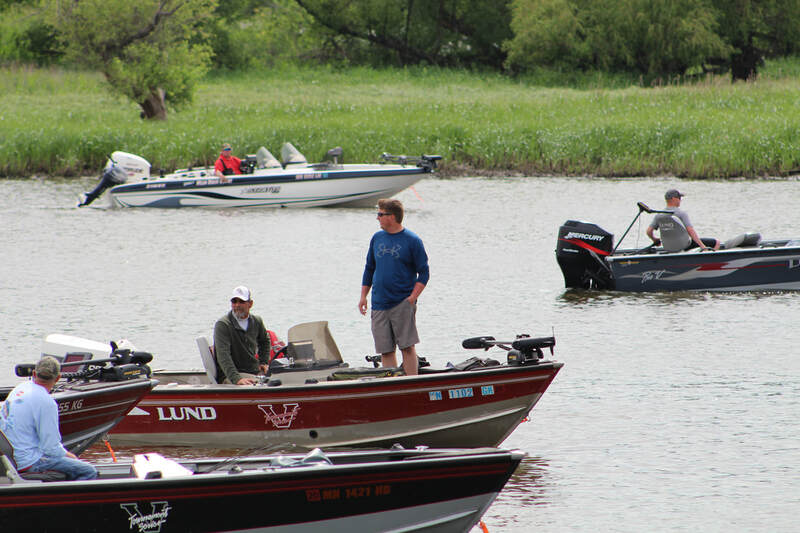 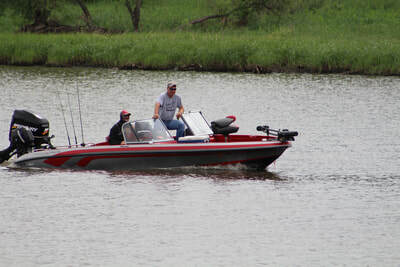 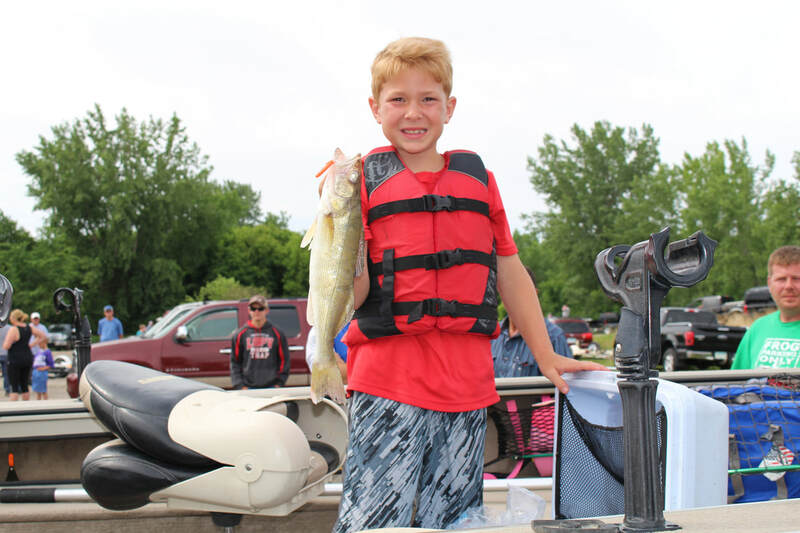 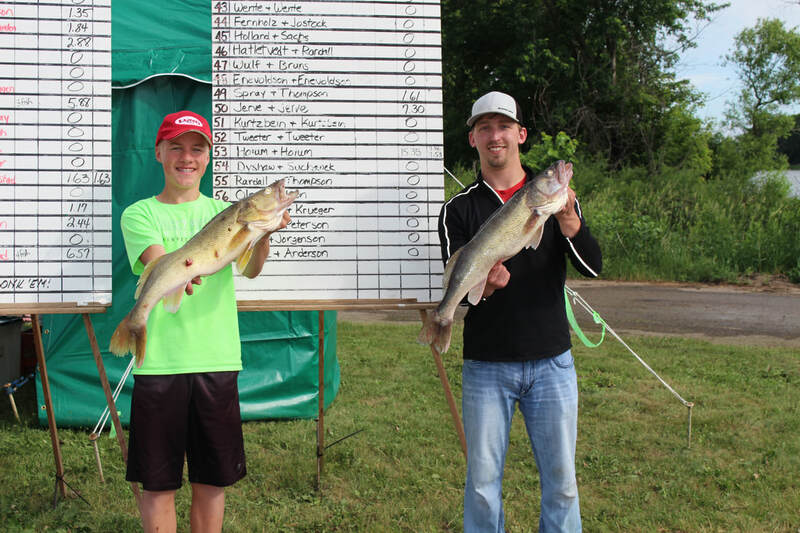 There were only 28 walleyes caught by 60 teams. 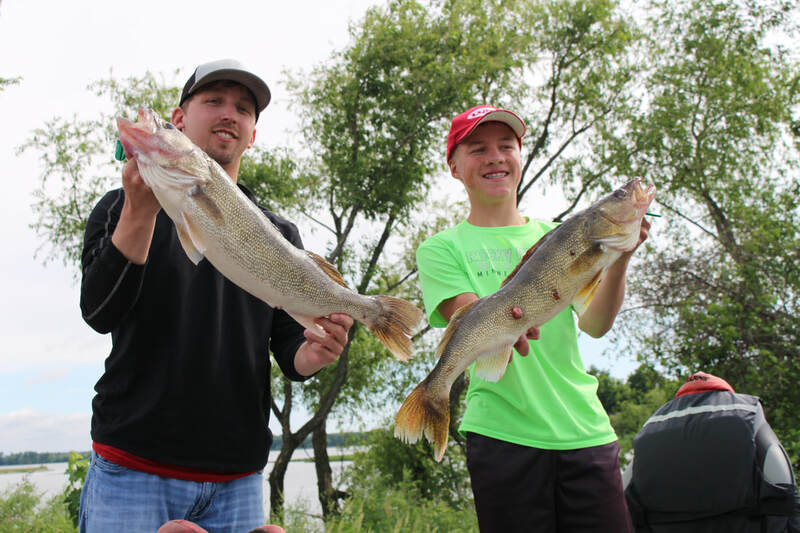 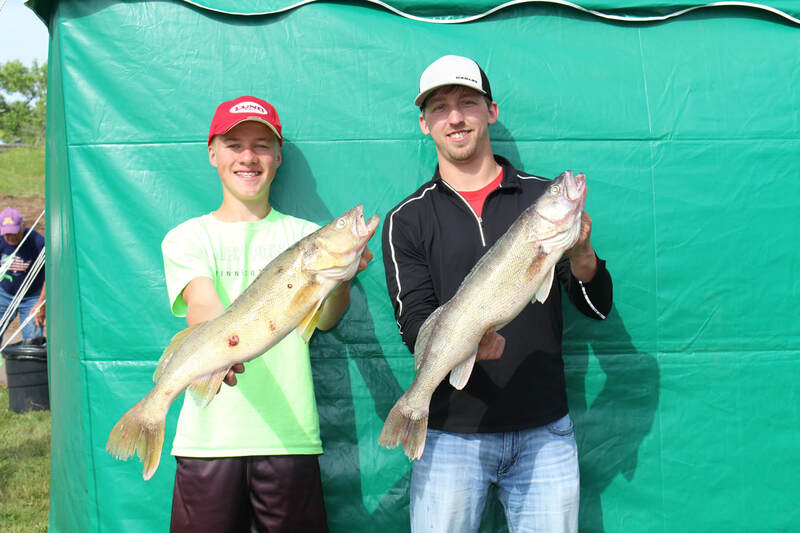 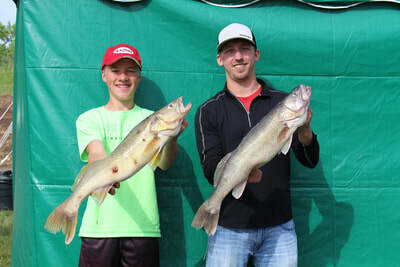 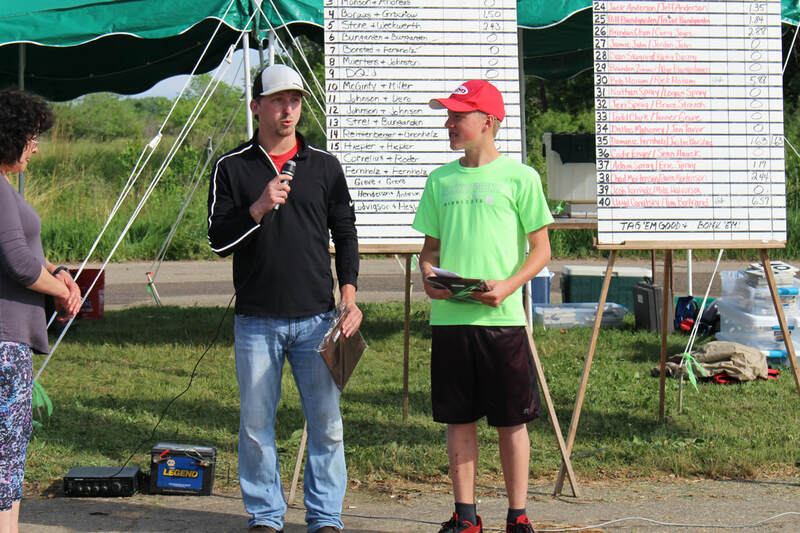 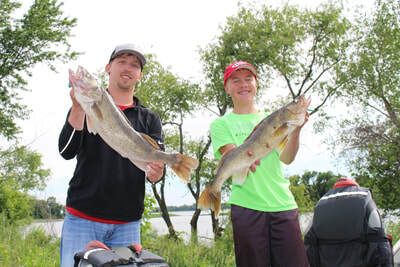 Ryan Hoium and Lucas Hoium took first place honors weighing in a 15.35 lb basket, including both big walleyes of the tournament, a 7.86 lb and 7.53 lb walleye. 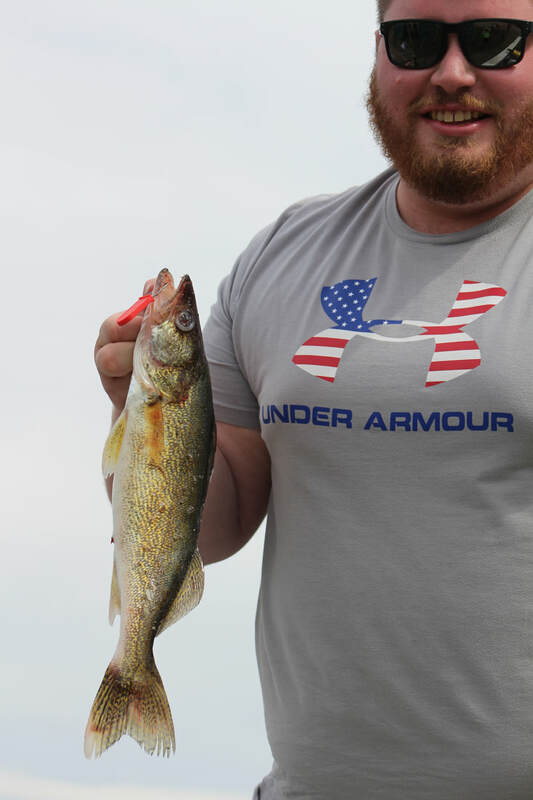 Both fish were caught later in the day, 10 minutes apart from one another. Their basket was good for $2200 for first place, $500 for both biggest walleyes and $530 for first in the option pot for a total of $3230. 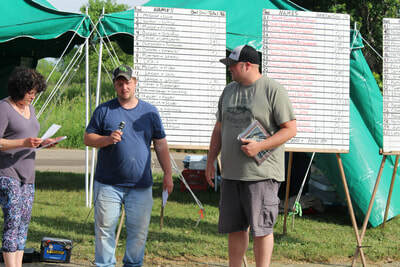 Jon Jerve and Paul Jerve took second place with a 7.30 lb basket good for $1400 and $318 in the option pot, for a total of $1718. 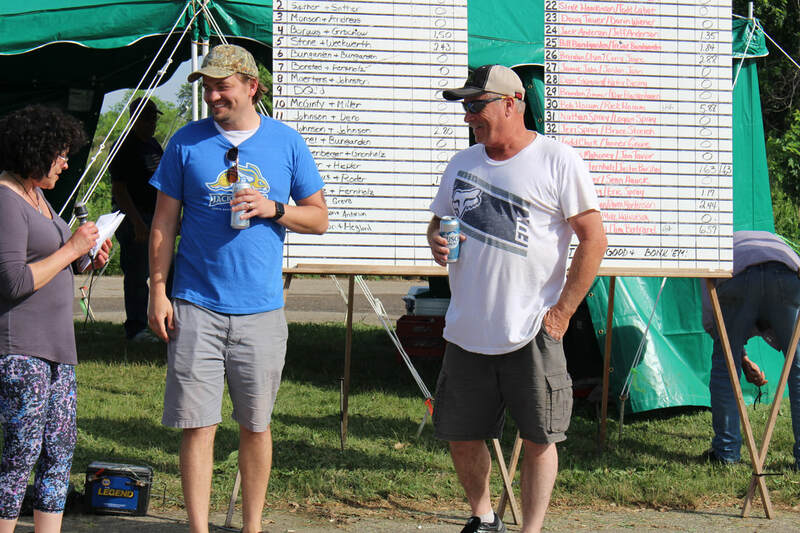 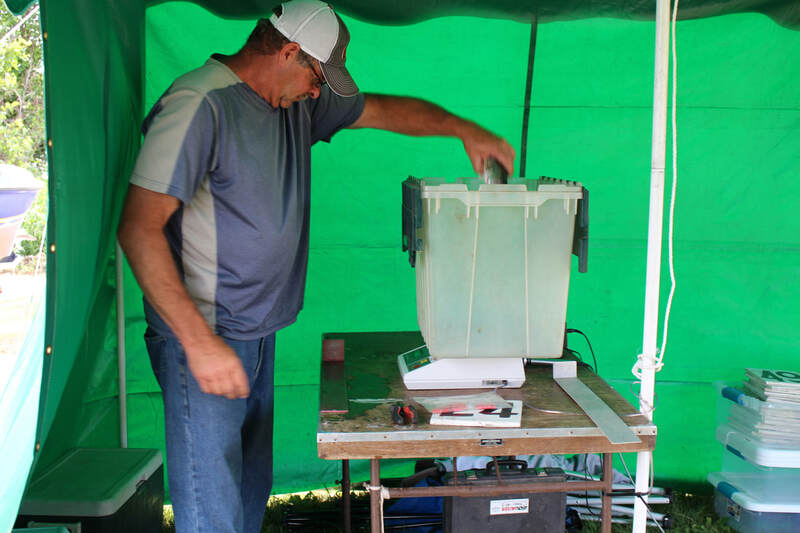 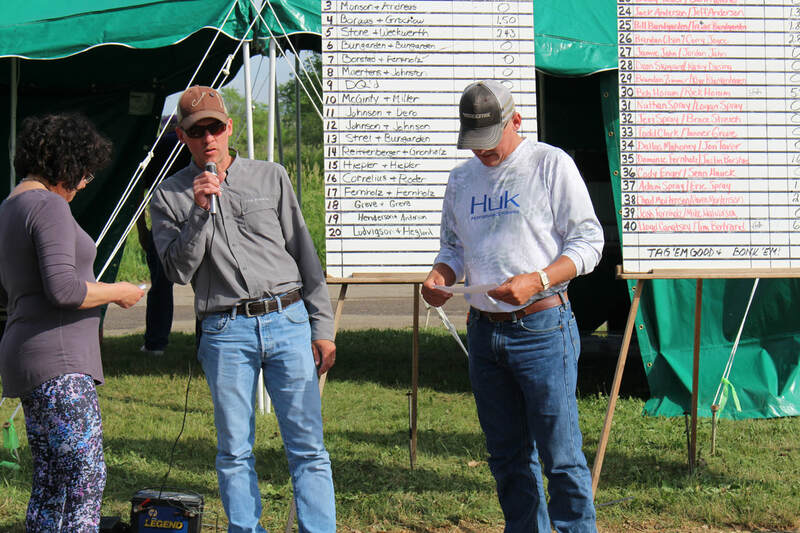 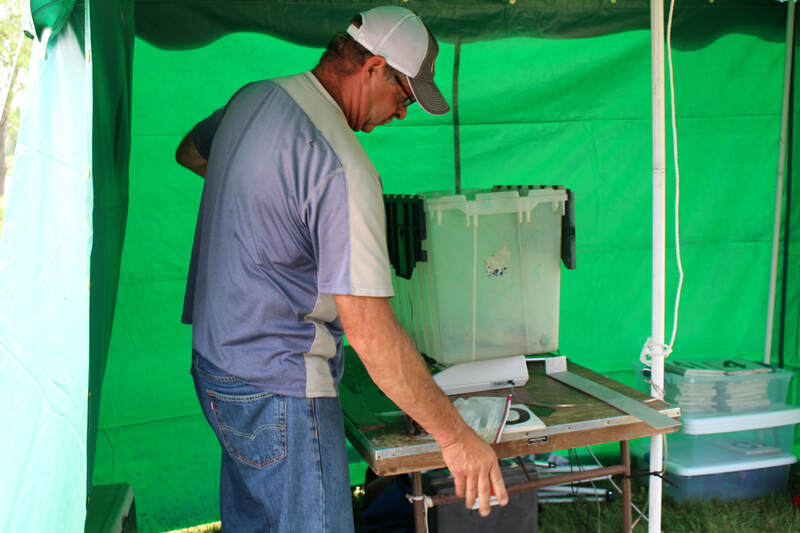 Third place went to Lloyd Canatsey and Tim Bertrand who weighed 6.57 lbs good for $900 and $212 in the option pot, for a total of $1,124. 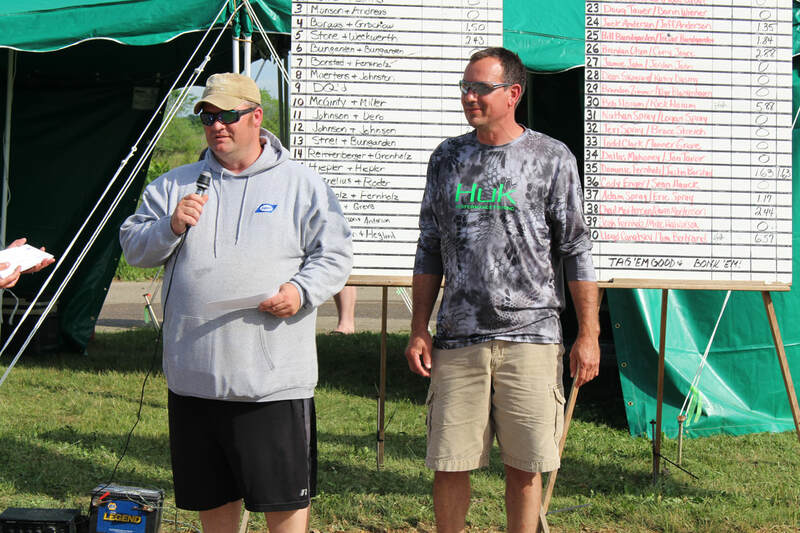 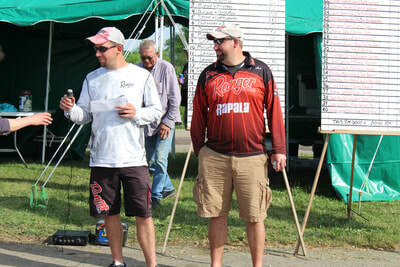 Fourth place was Rick Hoium and Bob Hoium who weighed 5.88 lbs. 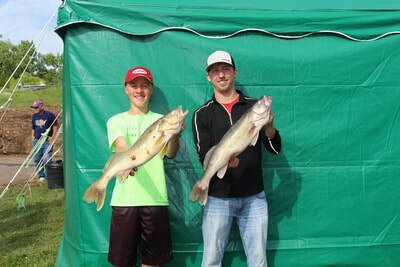 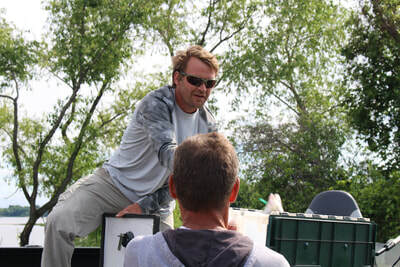 Fifth place went to Tom Ludvigson and Nils Hegland who weighed 3.52 lbs. 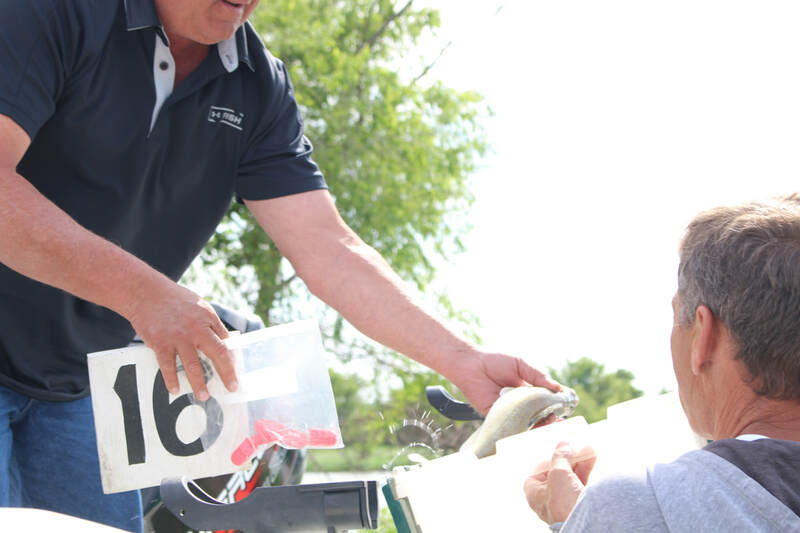 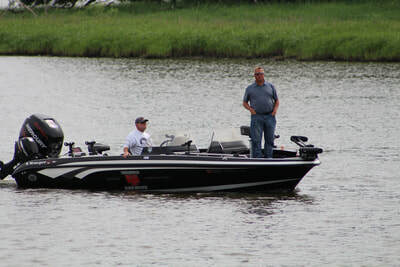 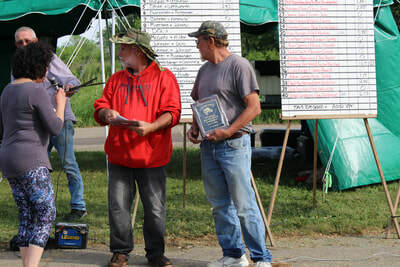 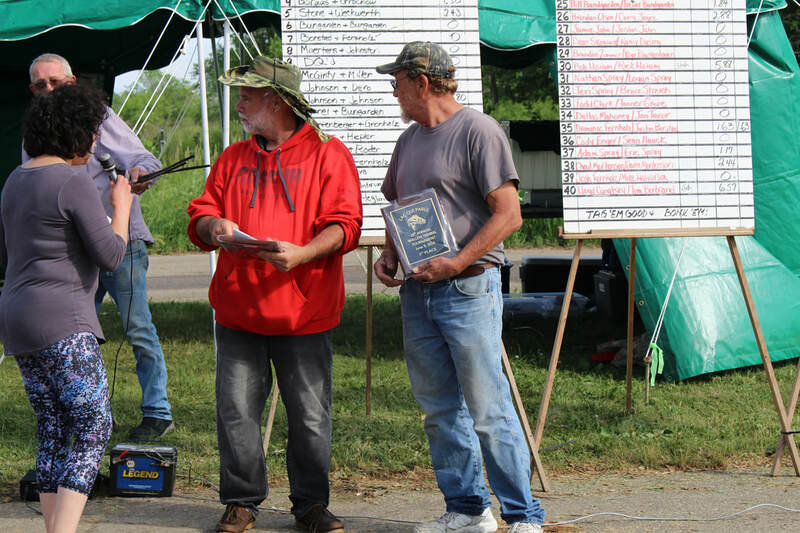 Sixth place went to Bob Henderson and Larry Anderson who weighed 3.05 lbs. Seventh place went to Brenden Olson and Corey Joyce who weighed 2.88 lbs. 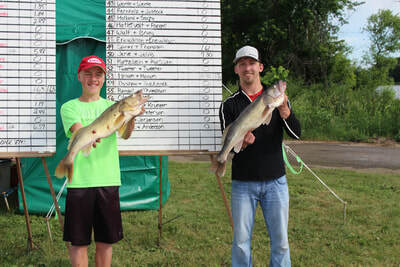 Eighth place was Brett Johnson and Mike Johnson who weighed 2.80 lbs. 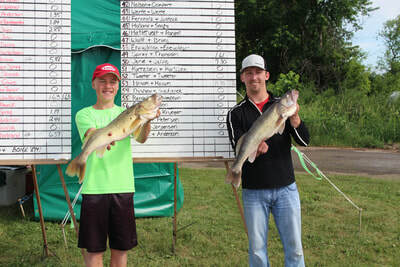 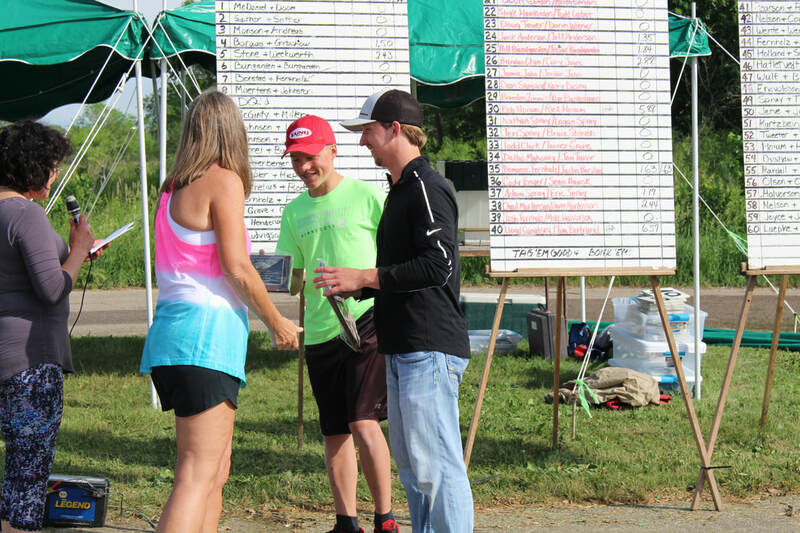 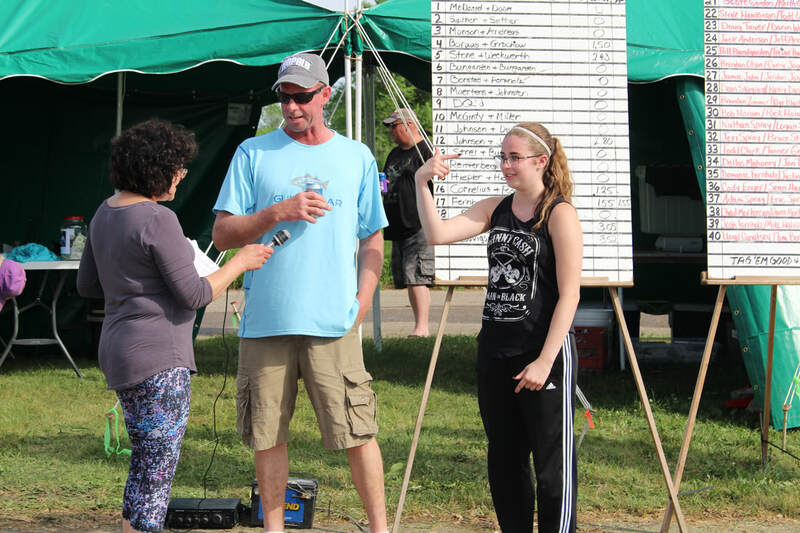 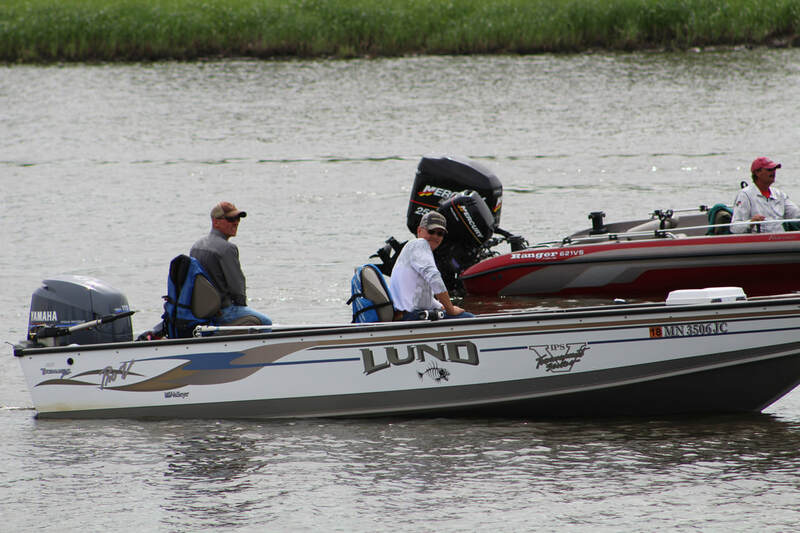 Ninth place went to Chad Mortenson and Raven Mortenson who weighed 2.44 lbs. 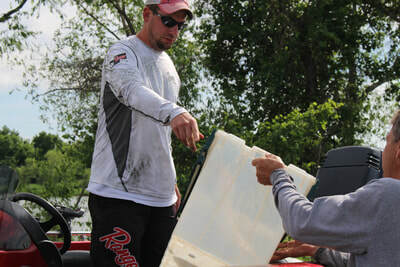 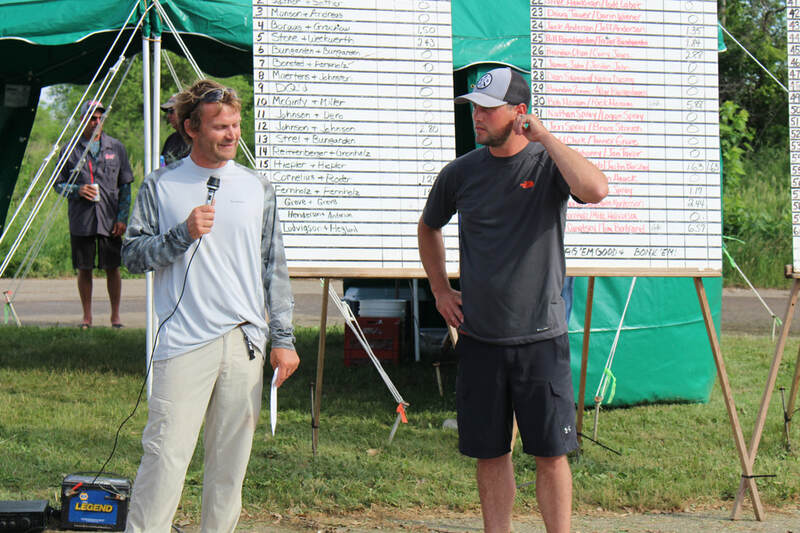 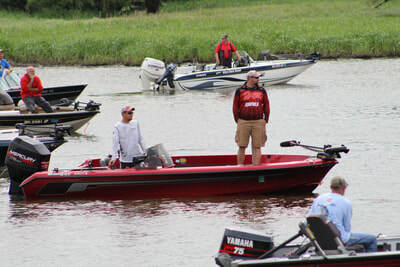 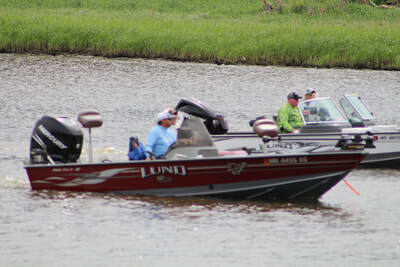 Rounding out the top 10 was Dustin Stone and Josh Weckwerth who weighed 2.43 lbs. 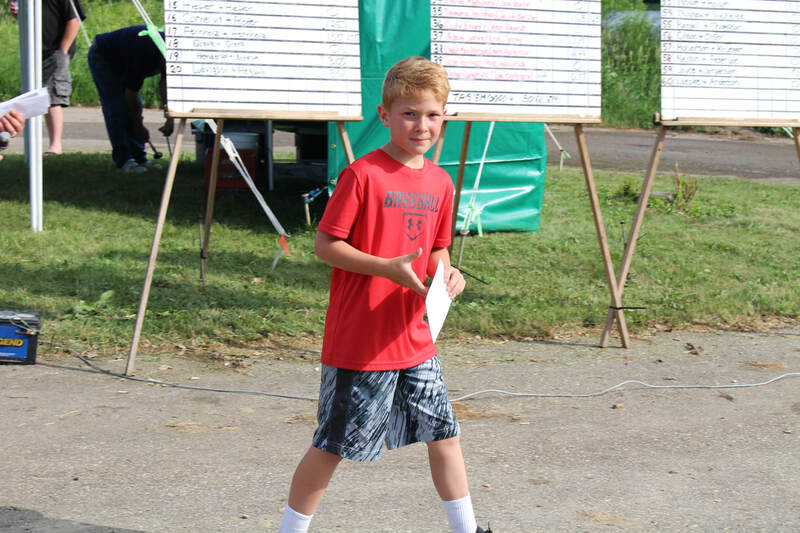 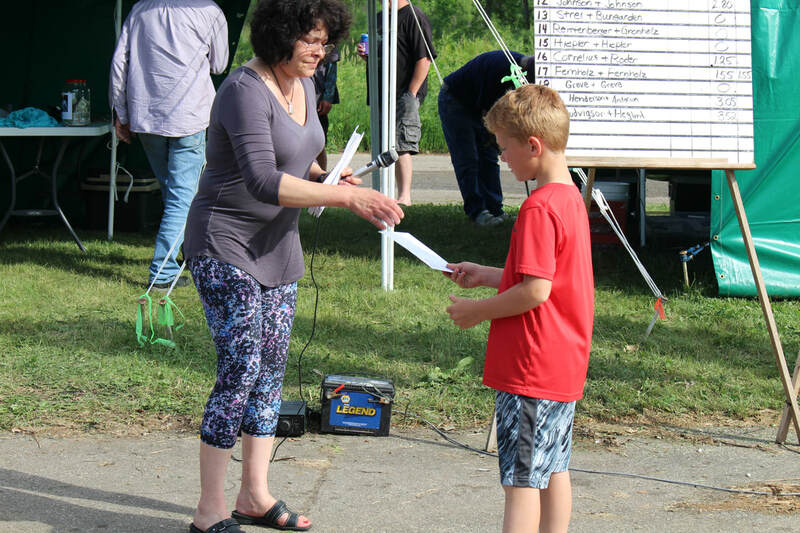 Grady Fernholz received the prize for youngest entrant in the tournament. Thank you to all the teams who participated in the tournament. 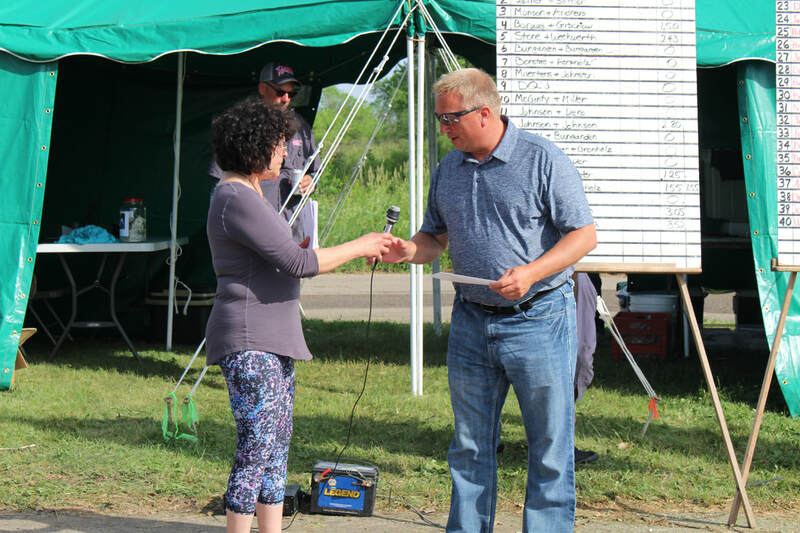 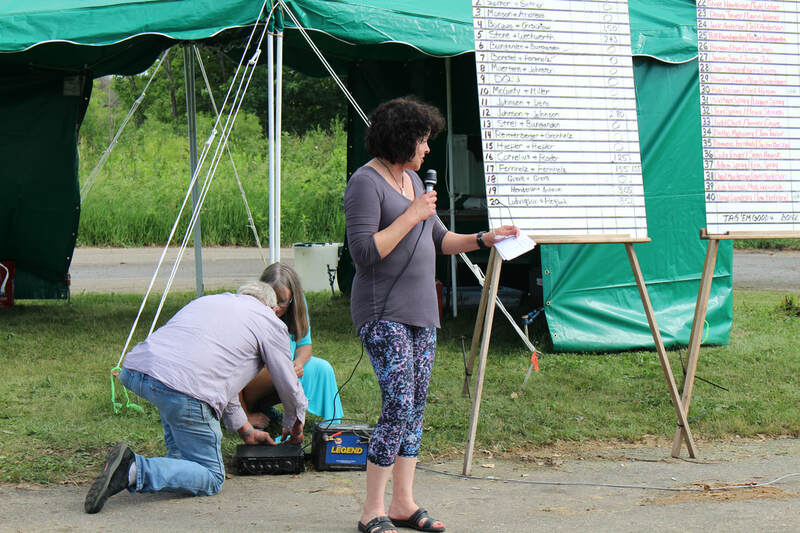 Also a special Thank You to Susan Stensrud for an outstanding job as tournament director and the many volunteers who made this tournament happen. We would also like to thank Lisa Bungarden for all the photos.